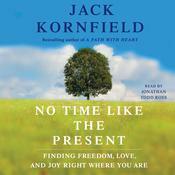 In this landmark work, internationally beloved teacher of meditation and mindfulness Jack Kornfield reveals that you can be happy now, this minute, with the keys to inner freedom.In his first major book in several years, the inspiring author of the classic A Path with Heart, Jack Kornfield, invites us into a new awareness. Through his signature warmhearted, poignant, often funny stories, with their Aha moments and O. Henry-like outcomes, Jack shows how we get stuck and how we can free ourselves, wherever we are and whatever our circumstances. Renowned for his mindfulness practices and meditations, Jack provides these keys for opening gateways to immediate shifts in perspective and clarity of vision, allowing us to see how to change course, take action, or—when we shouldn’t act—just relax and trust. Each chapter presents a path to a different kind of freedom—freedom from fear, freedom to start over, to love, to be yourself, and to be happy—and guides you into an active process that engages your mind, heart, and spirit, awakens your spirit, and brings real joy, over and over again. Drawing from his own life as a son, brother, father, and partner, and on his forty years of face-to-face teaching of thousands of people across the country, Jack presents a stirring call to be here, in the power of the now, the present, as we work through life’s passages. His keys to life will help us find hope, clarity, relief from past disappointments and guilt, and the courage to go forward. Jack Kornfield, PhD, cofounded the Insight Meditation Society in Barre, Massachusetts, in 1975 and later the Spirit Rock Meditation Center in Woodacre, California. He holds a PhD in clinical psychology. His books include After the Ecstasy, the Laundry and the national bestseller A Path with Heart.